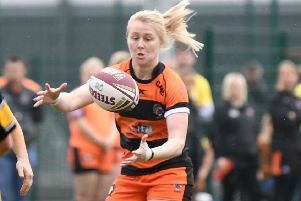 Castleford Tigers began their Betfred Super League season in fine style as they crossed for seven tries on their way to a 44-16 win over newly promoted Leigh Centurions. After being held scoreless for the first 20 minutes Daryl Powell’s men went on to give their opponents a ride awakening on how tough it can be in Super League on their first game back in the top flight. Luke Gale led the way with two tries and eight goals for a personal haul of 24 points, but this was an all-round team performance by the Tigers that put a marker down for them for the season ahead. Cas had to withstand a spirited start from Leigh, whose line speed early was good and they put the Tigers players under pressure all over the field, forcing errors. But one chance went begging when the visitors seemed to have an overlap and Josh Drinkwater chose to kick, with the ball going over the back line. Cas gradually found their feet with Paul McShane’s kick forcing a drop-out and a threatening attack ending as Michael Shenton dropped the ball with Greg Eden unmarked on his left wing 10 metres out. The pressure began to build on Leigh and their defence cracked on 20 minutes when Grant Millington, recently on as a replacement, turned in the tackle to offload to Luke Gale, who raced in for a try he converted. A Rangi Chase grubber forced another crop-out and from it the Tigers had their second try on 25 minutes as Millington and McShane combined to send Jesse Sene-Lefao over for his first try for the club. Gale goaled again. Cas lost the ball from the restart, but defended six tackles strongly 10 metres from their own line and were soon back in attack again to go over for their third try. Greg Minikin had an easy run-in on the right wing following Zak Hardaker’s pass and Gale’s goal from the touchline made it 18-0. Gale then added a penalty to stretch the lead further and the best try of the season following just before-half time. Minikin again did the finishing after an expansive move from half-way with Jake Webster supplying the final pass. Another touchline goal by Gale made it 26-0 at half-time. Cas carried on where they left off at the start of the second half with Junior Moors diving over from close range. With Gale converting it was 32-0 and effectively game over two minutes after the break. Leigh did finally get some points on the board as Ryan Hampshire, who was on loan with the Tigers last year, ran onto a short pass from Drinkwater to cross for a try. More pressure followed on the home line as Hardaker was pushed back to concede a drop-out and Eloi Pelissier’s kick hit the post and bounced back to Danny Tickle who dropped the ball on the line. But Cas weathered the brief storm and scored again just before the hour. Hampshire dropped Gale’s high kick, Gale followed up and hacked on to touch the ball down over the line for a try confirmed after several video referee replays. Another score swiftly followed at Greg Eden finished off a slick left side move with the final pass being played by skipper Shenton. Another touchline goal by Gale took the Tigers to 44 points and that was to prove their last points. Leigh earned some consolation with two more tries, Matty Dawson going over in the corner from Drinkwater’s long pass and ex-Tigers forward Tickle collecting his 100th career try. But they were well beaten on the night and Cas could have brought their 50-up late on when Eden took a Shenton pass and attempted to dive in at the corner, but the video referee ruled no try. Scorers - Castleford: Tries Gale 2, Sene-Lefao, Minikin 2, Moors, Eden; goals Gale 8. Leigh: Tries Hampshire, Dawson, Tickle; goals Ridyard 2. Castleford Tigers: Hardaker; Minikin, Webster, Shenton, Eden; Chase, Gale; Lynch, McShane, Springer, Sene-Lefao, McMeeken, Massey. Subs: Millington, Moors, Cook, Roberts. Leigh Centurions: Hampshire; Higson, Crooks, Brown, Dawson; Ridyard, Drinkwater; Hock, Hood, Tickle, Paterson, Stewart, Hansen. Subs: Pelissier, Vea, Green, Weston.